Assassin’s Creed Odyssey vs. Origins – what’s new? Once again it’s time to travel thousands of years into the past and stab people to death while wearing sandals – but despite surface-level similarities between Assassin’s Creed Odyssey and its 2017 predecessor, Origins, a lot more has changed within the franchise blueprint than first meets the eye. The ancient world makes a return this year, but we’re heading slightly further north and a few hundred years earlier. Greece in 431 BCE, to be exact. In this game you’re able to choose between a male and female protagonist, Alexios or Kassandra. In either case you’re an ultra-powerful mercenary – what luck! – and you’ll become increasingly involved in the civil war’s twists and turns as the game progresses. These events occur 400 years before those of Origins on the AC timeline, so it’s unlikely you’ll find any reference to the previous game this time – at least not in the historical setting. Meanwhile back(?) in the present day, Layla Hassan makes a return in her role as Animus outlaw, uncovering a grim conspiracy and travelling through time to uncover the truth of the Peloponnesian war that’s been kept out of history books for centuries. Perhaps there’ll be more opportunity for the story to bridge the two games in these present day sequences, although how frequently they feature isn’t known. For the first time in the series, player-driven romances with NPCs feature in Odyssey. Regardless of whether the player picks Alexios or Kassandra as their protagonist, both male and female romanceable RPGs will feature. Just don’t go breaking their hearts. Origins’ savvy repositioning of the combat model from action game button-bashing to an RPG-like hitbox mechanic went down a storm with players, and a similar system returns here with new bells and whistles. 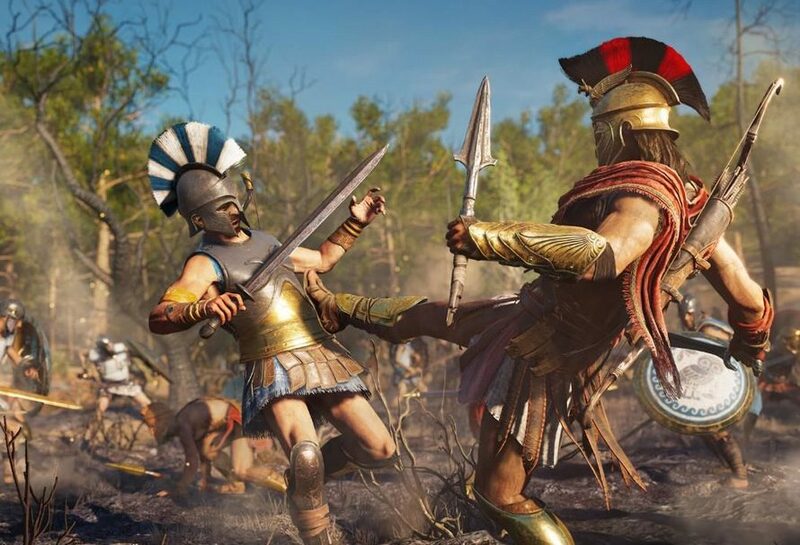 Alexios and Kassandra are able to unleash special attacks by filling up their meter during combat and hitting the special button at the opportune moment. In true RPG style, a greater variety of specials is unlocked as the character levels up, including the “This is Sparta!” kick, as it shall forever be known. Players were able to take to the water in various vessels in Origins, but it wasn’t the kind of full-blown naval affair Assassin’s Creed IV: Black Flag offered. This time the archipelago or Greek islands provides a perfect venue for larger ships, proper naval combat – dare we suggest – ancient Greek sea shanties? While the latter might be speculation, there’s definitely a return to controlling large sea vessels and ship-on-ship combat in this game. Let’s face it, Origins wasn’t lacking for size. The enormous world map housed geographical treasures that took tens of hours to be uncovered in between all the quests and collectible-hunting, but somehow it’s been dwarfed by Odyssey’s map. At 135 km squared, it’s 60% larger than its predecessor’s, and although some of it is Mediterranean sea, there’s a huge amount of environmental variation between its many islands. Expect ancient metropoli, lush greenery, olive and wine groves, volcanoes, mountains, fishing villages, farms, ancient monuments and much more.